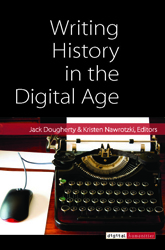 ¶ 2 Leave a comment on paragraph 2 0 We are proud to announce the latest title from digitalculturebooks, Writing History in the Digital Age edited by Kristen Nawrotzki and Jack Dougherty. This book is the third title in our Digital Humanities series and began as a “what-if” experiment by posing a question: How have Internet technologies influenced how historians think, teach, author, and publish? ¶ 3 Leave a comment on paragraph 3 0 To facilitate this innovative volume, Dougherty and Nawrotzki designed a born-digital, open-access, and open peer review process to capture commentary from appointed experts and general readers. A customized WordPress plug-in allowed audiences to add page- and paragraph-level comments to the manuscript, transforming it into a socially networked text. The finished product now presents 20 essays from a wide array of notable scholars, each examining (and then breaking apart and reexamining) if and how digital and emergent technologies have changed the historical profession. ¶ 4 Leave a comment on paragraph 4 0 Follow this link to buy the book or read for free online.